This Flaming Squirrel seed sauce is a nutritional birdseed supplement that contains all natural, 100 percent food grade ingredients with a super hot and spicy flavor. It tastes hot to mammals but not to wild birds. Simply add this liquid chili pepper formula to your birdseed or specialty suets to greatly reduce squirrel visits at the bird feeder. Not only will it help keep those pesky squirrels at bay, but also the liquid formulation sticks to birdseed better than chili powder and it won't blow chili dust in your face when you're mixing it. Flaming Squirrel is great in the garden too. 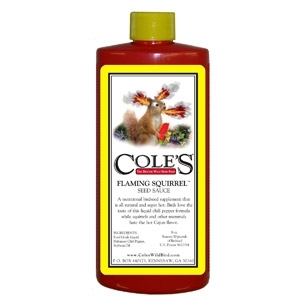 Pour Flaming Squirrel in a spray bottle and mist the plants that you don't want the critters to eat. To keep squirrels and voles from digging up your bulbs, dip each one before planting. This product is available in 8 ounces.